"BearBeats" feiert sein Auftakt im berühmten u. Extravaganten Club OrangePeel in der Frankfurter City. Was nicht fehlen darf, verrät doch wohl der Name !? 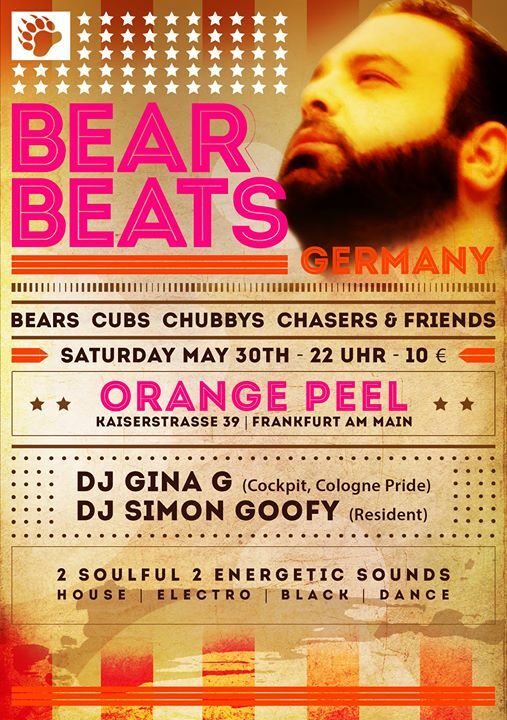 Bear Beats is going to celebrate his first Bear Party in Frankfurt City. For all Beary an Chubby men and their admirers. The Party will take Place in one of Frankfurt nicest Club „Orange Peel“.A Place to dance till the morning hours or chill in one of the Lounge Areas. move the Bear Beats. And Frankfurt´s finest Simon Goofy.